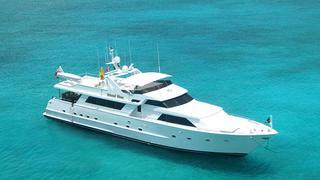 Word just in from Yachtzoo of a $100,000 price cut on the 32m raised pilothouse motor yacht for sale Island Time. Built by Broward in 1990 and refitted in 2007, Island Time is MCA compliant, sleeping seven guests in a master suite, VIP stateroom and a twin cabin with Pullman berth. Twin 1,080hp Detroit Diesel engines give her a cruising speed of 16 knots and a range of 3,000 nautical miles at 10 knots. Her large flybridge features a relaxation area, wet bar, Jacuzzi and Bimini top. Lying in Southeast Florida, Island Time is down from $1.95 million to $1.85 million.